[miau] If you are a fan of all those police shows on television that have become popular in recent years, you will absolutely love Cops n’ Bandits by PlayTech. 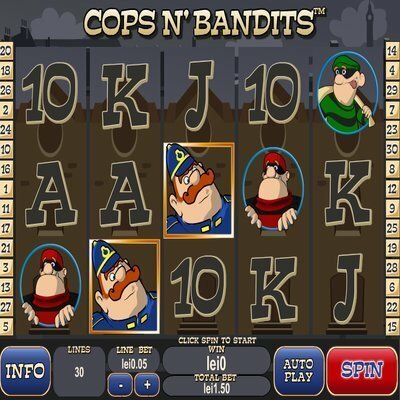 This video slot machine is a unique twist on the popular cops and robbers shows, full of unique characters who spring to life on the reels. The two robbers of the game are Skinny Larry and Tiny George. They are being chased by officer Slim McThin, who is determined to stop these two criminals from getting away with all that loot. Here is your chance to score some bags of cash and explode your bankroll. The unique symbols in Cops n’ Bandits start with the traditional playing card symbols. The Ace, King, Queen, Jack, Ten, and Nine are colored with a greyish texture, allowing all the other valuable symbols to pop to life on the reels and make them more recognizable. The better paying symbols are the handcuffs and bag of money, followed by officer McThin, then Larry and George. There are several other symbols that help to unlock more money and get you to the bonus features. The presentation of the Cops n’ Bandits is fun from the beginning. Add in all those bonus features and how the main characters pop to life during game play and you have the makings of a classic video slot. Right from the into scene where you are introduced to the main characters the action starts. The brick wall with the word WILD on it is of course the wild symbol and substitutes for all the other symbols on the payline except for the scatter and the lineup icon. If you are lucky enough to get 5 of the wild symbols on a payline, you break the bank and walk away with 4,000 coins. The bonus features in this game are where all the excitement is. The golden police shield is the scatter symbol. When you get 3 of the scatter symbols, you unlock the free spin bonus round. This is where the player will select one of the badges to reveal the amount of free spins they receive. If you had 4 or more scatter symbols, you get to choose 2 of the shields and the total spins is added together. During this bonus round there are locking wilds that remain in place until the bonus round is completed. The next bonus involves the black lineup figure symbol, and getting one of these symbols on reel 1, 3, and 5, unlocks the Line Up Bonus. Once the bonus is unlocked, you will have a police lineup of 6 criminals standing in front of you. Above the criminals is the reward for picking him correctly out of the lineup. If you guess correctly, you win the reward money. Each time you select the wrong criminal, money is deducted from the reward. The sooner you can guess the right criminal, the bigger reward you receive.